We move slightly West and on to the 5th – 4th Century BC to find ourselves in Ancient Greece amidst a performance of “Oedipus Rex” written by Sophocles circa 428 B.C. There are two gentlemen in the forefront with a 3rd in the back holding his mask awaiting his role (1) (he’s actually wicked close, check out the forced perspective, I refer to him as “little dude” in the next post). Athenian society as a whole was inspired with a sense of event and the things were done in a theatrical fashion. Communication modes were limited limited during this time and it was drama that played an effective role as a mode of communication to the citizens of the ancient Greek world (2). The Greeks had adapted the Phoenician alphabet around the 8th Century BC by using five of their consonants as vowel sounds (3). During the 4th century, the transition from orality to literacy solidified (4). Literacy was becoming increasingly important as more and more Greeks were able to better understand and adopt the alphabet compared to logographic scripts. Writing lead to changes in rhythm and diction. Writing lead to more well rounded character development that was first seen in the play depicted in this scene. As literal culture developed, more actors appeared on stage. In fact it was Sophocles himself who introduced the third actor to the stage (5). 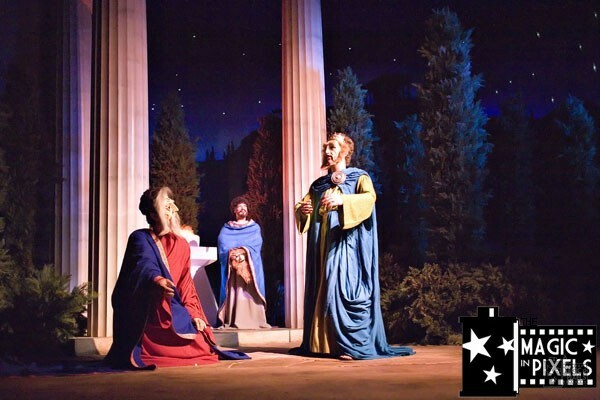 Now that we have three actors on stage there are more people to play the parts, but these dramatists would often still have to play multiple people in the course of the play. This is one reason for the greek masks that were worn in this scene. 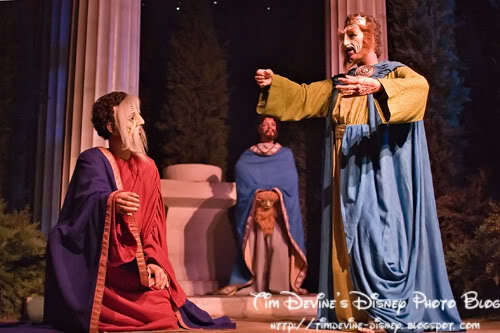 The greek theaters were large, seating 10’s of thousands at a time and so the masks were also exaggerated so that audience members in far away seats could understand what character they were seeing (6). 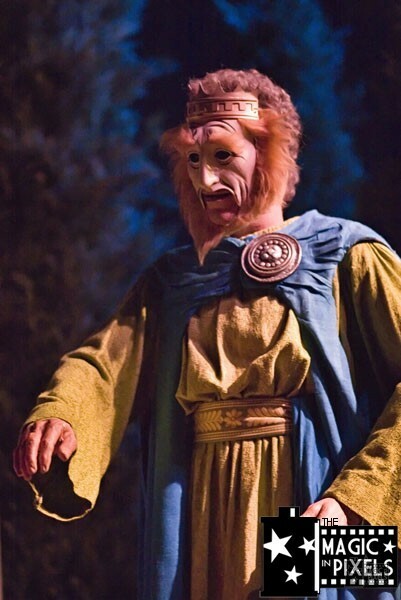 The shape of the mask also amplified the actor’s voice, making his words easier for the audience to hear (7). When turning the corner to this scene on the right the first thing we see are the greek columns on the left. The actors on the stage are also standing in front of greek columns. 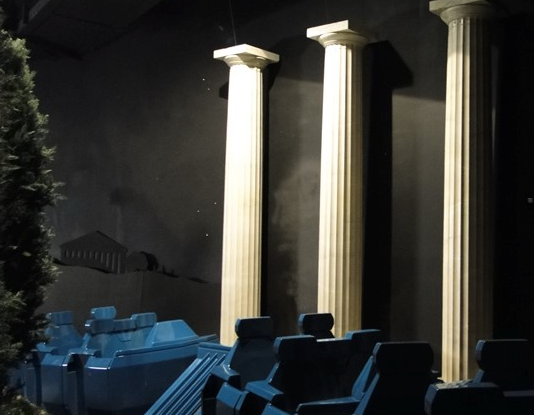 These columns are designed with the Doric order of architecture. In the Doric Order, the column shaft is simple and tapered, meaning it is wider at the base than the top. Each column has 20 parallel, vertical grooves called flutes. Columns in the Doric Order did not have a base but rested directly on the pavement of the temple. The top of a column has a wide, flat section (8). This scene has a lot of shrubbery. Based on the region and time period they appear to be either Juniper Shrubs (also found in Egypt and Phoenician areas) or Cypress evergreen. I’m sure you Disney regulars will know where I’m going to go with this. 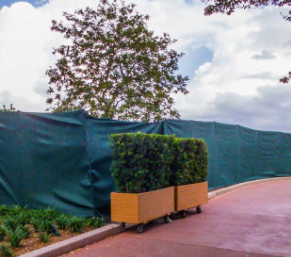 Are these the same shrubs Disney uses to cover up areas they don’t want you to see? Is it possible that this scene is under construction?! See the next post about the major changes made in 2008 that focus on Greek communication outside of the theater. In ancient Greece, the spoken word was elevated to a fine art. Philosophers debated with one another in plazas and storytellers found a new forum for personal expression. The theater was born. In classic Greece, the alphabet grows and flowers with new expression and a new stage of storytelling emerges. A stage on which we examine our world and ourselves. The theater is born. Deep in the shadows of Mount Olympus, our alphabet takes route, flowering with new expression. Hail the proud Greeks: Aeschylus, Sophocles, Euripides. The theater is born. And now for all, the printed word! With ink and press we made new walls, bound volumes of Ecclesiastics and Plato! Of Galileo and Homer! Scholar! Scientist! Philosopher! WE caught your should in type and printed you forth in mobs. By the hundreds! By the thousands! Bamunusinghe,S (2012).Drama as a Mode of Communication in the Ancient Greek World. Sri Lanka. Journal of Human Resource Management Vol.3, No.1.